Audacity is the premier free audio recording and editing software currently to have ever existed. It is freely distributed as open source software that anybody can use. 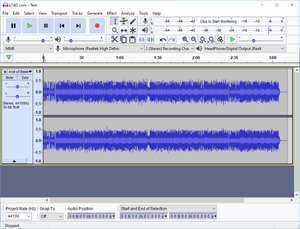 With the removal of Windows' sound recorder, there opened up a huge need for a free audio recording solution and the team behind Audacity took up that challenge. Audacity is able to record live audio from your microphone or other sources, covert tapes and records to mp3s or digital CDs, Edit OGG Vorbis, MP3 and Wave files (among others). Version 2.3.1 is a freeware program which does not have restrictions and it's free so it doesn't cost anything. For security reasons, you should also check out the Audacity download at LO4D.com which includes virus and malware tests. Additional screenshots of this application download may be available, too. Audacity download been highly rated by our users.